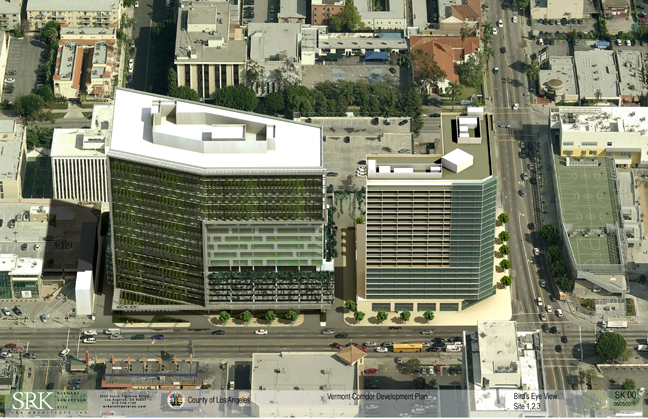 The Board of Supervisors voted on August 18 to start soliciting bids to tear down some of Los Angeles County's most dilapidated government office buildings to build a new headquarters for the Department of Mental Health and one or more residential towers. Supervisor Mark Ridley-Thomas championed the redevelopment of more than 1 million square feet of county office space along a quarter-mile stretch of South Vermont Avenue between 4th and 6th streets. The county will be looking for one developer to step in to build on three separate sites in the ``Vermont Corridor,'' including one that may include affordable housing for seniors. ``It's an innovative approach that transforms once-neglected county resources into modern facilities that would serve the public in a variety of ways, including creating jobs, revitalizing communities, generating new revenue streams for the county and addressing urban blight,'' Ridley-Thomas said. Ridley-Thomas stressed the need for transparency in the leasing and acquisition process. Ridley-Thomas had questioned a 2014 proposal to purchase the Saturn Building in Monterey Park to relocate the Department of Mental Health, asking why alternative sites weren't considered and expressing skepticism about the estimated total costs of the project. The county ultimately abandoned that option. ``Extraordinary care and diligence must be taken to preserve fairness, ensure efficiency, provide equal opportunity and reinforce public trust,'' Ridley-Thomas said. The total project cost is estimated at $453 million and expected to generate about 1,355 construction jobs, according to the Los Angeles County Economic Development Corp.